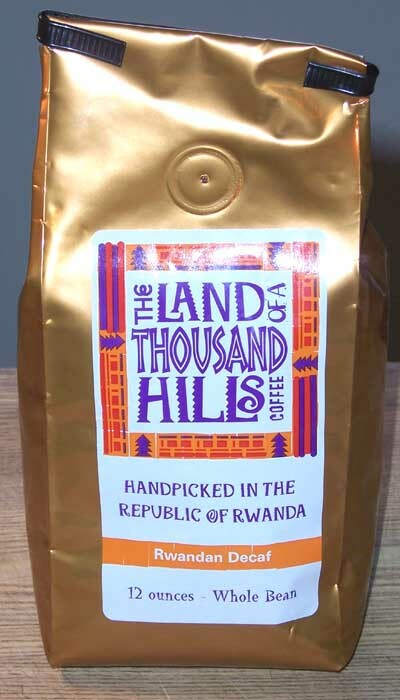 We are always on the lookout for a good decaf coffee so we were looking forward to trying this one from Land of a Thousand Hills (www.drinkcoffeedogood.com). One of the things we appreciate about this roaster is how they trying to help the farmers in Rwanda. They focus on Community Trade, paying farmers a fair living wage for their coffee while working to build relationships and promote community. They grant micro-finance loans to widows and bikes to farmers through Sustainable Cycle. They care for orphans in Bukonya and build community with a sustenance farm and soccer filed. It really sounds like they are trying to help improve the lifestyles of the farmers through many good works. As usual we started out with the auto-drip for an early evening cup of coffee. This water processed decaf has a nice roasted, spicy aroma which seems to be enhanced after grinding. It has a good naturally sweet flavor. There is also a little bit of tanginess to the coffee. Next was the French Press and here the naturally sweet, roasted flavor comes through strong. Though this is a dark roast, it is not over roasted and the subtle flavors are not covered up. It feels like a medium body and has a spicy, cinnamon aftertaste. The aroma is more pronounced in this brewing style. It paired well with cinnamon graham crackers. We also used the Clever Coffee Dripper to brew this coffee. For people who just want one cup of coffee this brewer is ideal. We find we use it more and more and like it a lot. The acidity is mild and seems to hit the front half of the tongue. This coffee is naturally sweet and has a clean feel. Both of us enjoyed the taste of this coffee. Our friends who are decaf drinkers liked this coffee also. They also liked learning about Land of a Thousand Hills and what they are doing to help the coffee farmers of Rwanda. This seems like a good coffee roasting company/ministry. If you like decaf coffees we suggest you try this Rwandan Decaf. We and our friends enjoyed it. We received this coffee for free and offer objective feedback. Until next time, remember to stop and enjoy the coffee and conversations.